03 October 2014 MidiBridge 1.59 is now available for iOS8. 19 September 2014 Unfortunately MidiBridge is not working under iOS8. We are trying to get a fix out as soon as possible. In the meantime, if you rely on MidiBridge, do not update to iOS8. 24 March 2014 The MidiBus Library has been available for a couple of months and a number of developers have started using it. There are a number of upcoming apps and updates pending and when these have been released the website will carry a list of current apps. 13 December 2013 MidiBus is here. There is an app in the app store and a developer library of the same name. Details of the library are here and an app based on the library is available now in the App Store. This site will be updated with the new app ASAP. Click/touch here for older news. About us: Audeonic Apps is a Dublin (Ireland) based software developer specialising in applications for mobile platforms. We began writing commercial software in 1984 and have been developing in C for 25 years. As well as creating our own ideas we are also available for custom development; contact us to discuss your project. If you're interested in reviewing any of our apps for a website or publication, please drop us a line for a promo code. Please visit the Support page or our soapbox forum. Having trouble figuring out how to connect things in MidiBridge and how CoreMIDI works? Also our guide to the new port modules in version 1.4 is available here. 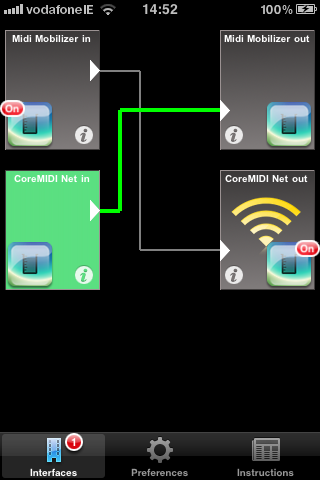 Interconnect all MIDI interfaces on your iOS device and bridge external MIDI devices wirelessly via CoreMIDI networking. Supports Line6 Midi Mobilizer (I and II), IK Multimedia iRig MIDI, Akai SynthStation 25 and any iOS supported USB MIDI interface via camera connection kit on iPad. Interconnect interfaces to/from other running apps that are OMAC (Open Music App Collaboration) compatible. Interconnect any MIDI in to any MIDI out on your iOS device including physical and virtual CoreMIDI ports. Breathe life into your Akai Synthstation 25 and Line6 Midi Mobilizer (original) by making them CoreMIDI capable. Transmit to/from external MIDI devices to a remote DAW (for example) or other MIDI device wirelessly using CoreMIDI networking. Filter MIDI events separately on each input or output. Clone MIDI events from one input to several outputs. Split MIDI events from one output across several outputs. Microtune your H-Pi Microtonal UPLEX/TPX keyboard. Adding original Midi Mobilizer or SynthStation 25 support to newer apps. Other app must have CoreMIDI Virtual/Net support, and you need to be running iOS5 for MidiBridge to be backgroundable with these devices. Redirect/split by MIDI channel output of one app to other apps. Eg. Channel 10 to a drum machine and other channels to synths from a sequencer app. Control SampleTank from other apps. Perform wirelessly on stage with a MIDI controller (keys/drums/wind/??) using your iOS device+external interface+MidiBridge. Wirelessly control your DAW transport using a dedicated control surface that has MIDI out. Place inline in your MIDI network as a powerful filter/clone/merge tool. Send MIDI output from your sequencer wirelessly to remote sound generators. ... please tell us how you use MidiBridge! MidiBridge was carefully crafted to filter and route as efficiently as possible; with hardware interfaces the latency is very, very small and even with CoreMIDI Networking (RTP) the latency ranges between 3-8 milliseconds depending upon the situation, which is still very usable for most applications. You can view the app's manual here to review the entire functionality and interface. Also don't forget to read our Understanding MidiBridge guide too. 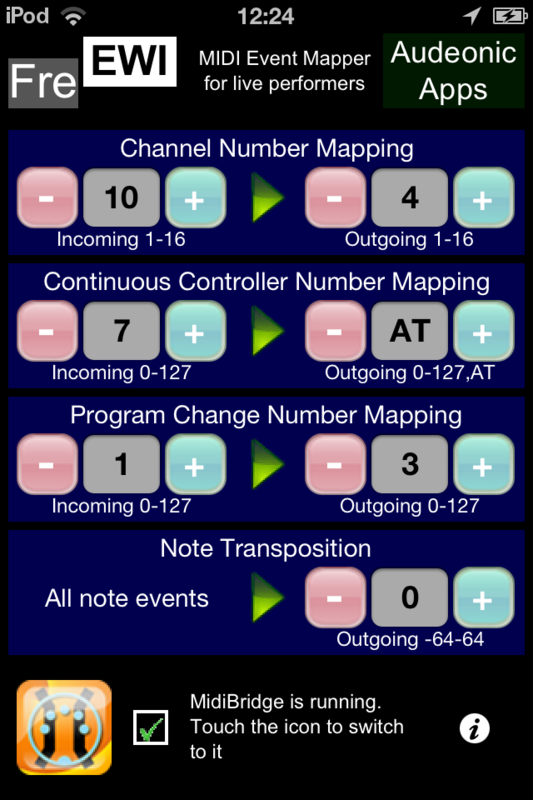 MidiBridge is available in the App Store via iTunes for iPhone/iPad/iPod Touch. Support for Akai Pro's SynthStation25 keyboard controller is included. SynthStation25 delivers instant hardware control for improved performance capability and expression. For more information on SynthStation25, visit http://www.synthstationapp.com. 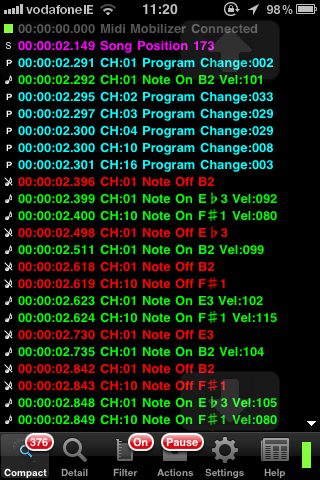 A swiss-army knife utility for real-time and inline MIDI event monitoring, capturing and filtering. Perfect for troubleshooting and analysing MIDI sources in a compact and portable package. Compatible with iPhone, iPad and iPod Touch. If you need to see what any MIDI device is sending then using MidiVision (and physical, network or virtual MIDI interface) on your iPod Touch, iPhone or iPad provides a simple, handy and extremely portable solution. Ideal for musicians, studio engineers and roadies who need to solve MIDI problems quickly. It's like a sophisticated cable tester for MIDI hell! Essentially this is an app you need to have on your device if you own an iOS supported Midi Interface or use CoreMIDI network or virtual ports. You never know when you may need it. Very simple. Start up MidiVision, connect your Midi Interface to your iDevice and a MIDI source and all data from the source will be displayed on the screen. Scroll up and down to review the data and flip between compact and detail modes to see less or more detail. Double-tap the clear hotspot to clear events on main page. Get more adventerous with filtering, MIDI thru and emailing your events. You can view the app's manual here to review the entire functionality and interface. MidiVision is available in the App Store via iTunes for iPhone/iPad/iPod Touch. Designed as an add-on to MidiBridge following requests from EWI players, FreEWI (pronounced Free-Wee) is a music utility app that allows processing of MIDI events that pass through it. A very simple (basic?) interface lets you select which incoming parameter you want to alter on the left and what that parameter will be converted to on the right. Use plus/minus buttons or enter values with the keyboard. Although it works best with MidiBridge, FreEWI can be used with any app that can read/write to FreEWI's virtual ports. If an app can both read/write then FreEWI can be used as a MIDI send/return app. You can use FreEWI to transpose the Akai SynthStation 25's keyboard to work with BeatMaker 2's drum pads, for example. It uses the same MIDI engine as MidiBridge so events are processed very quickly. However, a touch of latency (~2ms) is added when FreEWI is inserted into the event stream. Supports fast-switching to MidiBridge and from other OMAC fast-switch apps. This page does not use frames, cookies, java or plugins and should be viewable with just about any browser.